Vehicles in Wyoming equipped with new communication technology will soon help make Interstate 80 safer for travelers. 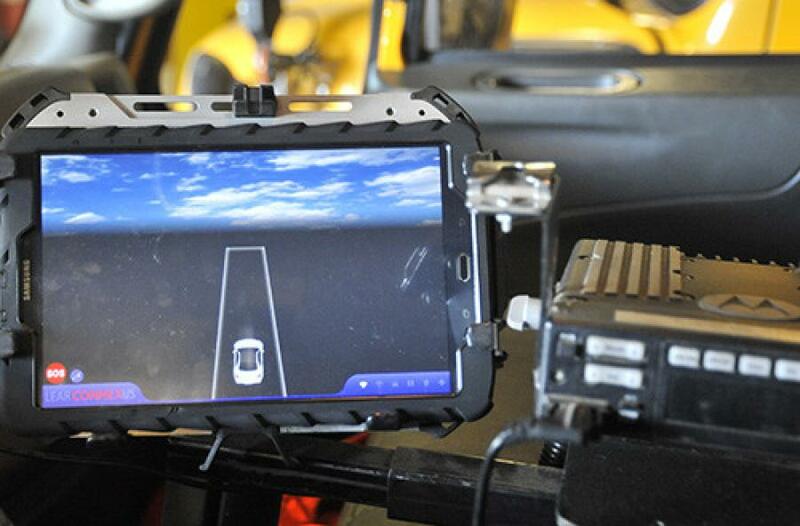 The Wyoming Department of Transportation, the University of Wyoming and their partners demonstrated the new connected vehicle technology recently in Cheyenne to show how vehicles and roadside units can communicate road information and alerts to other motorists in near real-time time. “This new technology is designed to provide travelers with additional information so they can make informed and safe decisions about their travel plans while they are on the road,” said Ali Ragan, GIS/ITS project manager. WYDOT received a grant previously from the U.S. Department of Transportation to develop and participate in the Connected Vehicle Pilot Deployment program. Wyoming is one of only three locations in the nation to participate. This winter, WYDOT will install onboard communication devices on 100 of the department's vehicles, including snow plows and patrol vehicles, and about 75 roadside units on and around I-80 as part of phase two of the connected-vehicle project. During phase three in the spring and summer, WYDOT will equip about 300 commercial trucks with the technology. During phase one in 2016, WYDOT and its partners planned the project. Once phase three ends, WYDOT and its partners, and the United States Department of Transportation will each review the research to determine if the technology is beneficial. The demonstration used several vehicles, including a WYDOT snow plow and patrol vehicle, to show how they can communicate with each other during a forward collision warning, a distress notification, a construction zone notification and weather warnings. Depending on the situation, the technology would either interact vehicle to vehicle, vehicle to roadside unit or roadside to vehicle. In the event of a forward-collision warning, the vehicle moving at slower speeds would send out a signal indicating its speed, direction and heading. Other vehicles in the vehicle stream equipped with the technology would pick up that notification and drivers will be alerted if there is danger of crash. WYDOT also is partnering with Sirius XM to help get the notifications to vehicles. Sirius' satellite system has 100 percent coverage within the I-80 corridor, which means equipped vehicles can receive the messages no matter where they are. The Sirius partnership can help fill in any gaps with the 75 roadside units. However, WYDOT still needs to have the roadside units because Sirius can send the information but not receive it. John Dooley, owner of Dooley Oil of Laramie and former Wyoming Transportation Commission chairman, said the new connected vehicle technology can definitely help with safety. Dooley's company is participating in the pilot program, and his trucks will be equipped with the technology. WYDOT is still looking for fleet partners to participating in the pilot program. Companies interested in partnering with WYDOT can email the department at dot-cv@wyo.gov or call 307/777-4231 or 307/777-2985.